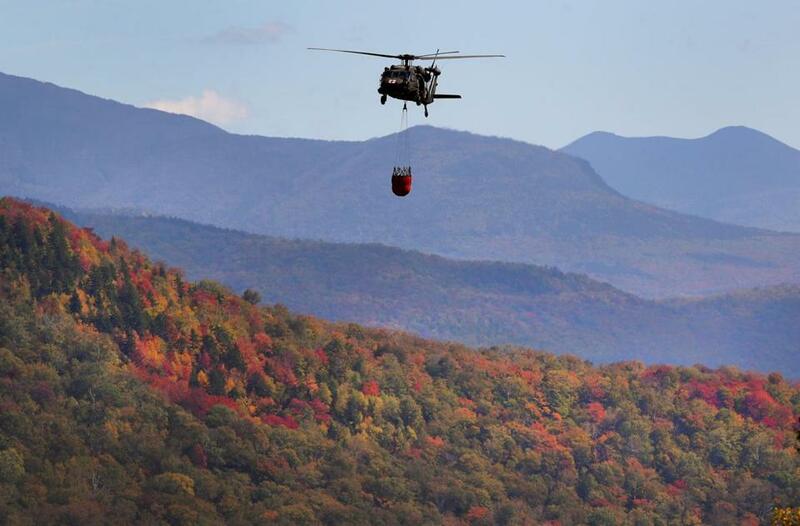 A black hawk helicopter dumped 600 gallons of water near the peak of the 600-foot high ridge. WOODSTOCK, N.H. — The tourists have begun arriving by the thousands, just as the leaves of the majestic forests here have begun to pop colors of red, orange, and yellow in time for the holiday weekend’s foliage tours – and just as the largest wildfire locals have seen in decades has begun to roar through these White Mountains. Yet the only thing stranger than the unfortunate timing of the wildfire is that a local man reported seeing a meteor days ago near a ridge where the fire erupted, a claim that scientists call unlikely but still one of the few possible explanations to a fire that could rage for days, if not weeks. On Thursday, roughly 75 firefighters, aided by Black Hawk helicopters dumping hundreds of gallons of water from a nearby pond, struggled to fend off a blaze that has tripled in size to 75 acres over three days, fueled by dry growth with little rain in the forecast to help. “There were some heavy wind gusts, and it just blew it up” and over a ridge, said Fire Chief John MacKay. An unidentified witness, from Bath, told authorities he saw a meteorite Monday evening, right around the time the fire could have started. It couldn’t have been lightning; no one reported seeing any and it hasn’t rained. Hikers traverse the many trails and cliffs in that area, including a section of the renowned Appalachian Trail. But the fire seems to have originated along a granite cliff, and it’s unlikely a hiker would have set up a camp spot on a 45-degree ledge. A discarded cigarette? Maybe. But it’s unlikely a smoker would want to make his or her way up what is known as Dilly Cliff. “It’s a hand over hand trail, and it’s tough,” said Jayne O’Connor, president of the White Mountains Attractions Association, which manages visitor centers and attractions throughout the national forest land. “I don’t think it’s a very likely scenario,” Williams said. Pockets of flames carried by winds have helped the blaze spread through the woods and up granite ledges, fueled by heavy ground growth as well as the red spruce and balsam fir timber that are common to the region. The area has not seen a significant rain for weeks. 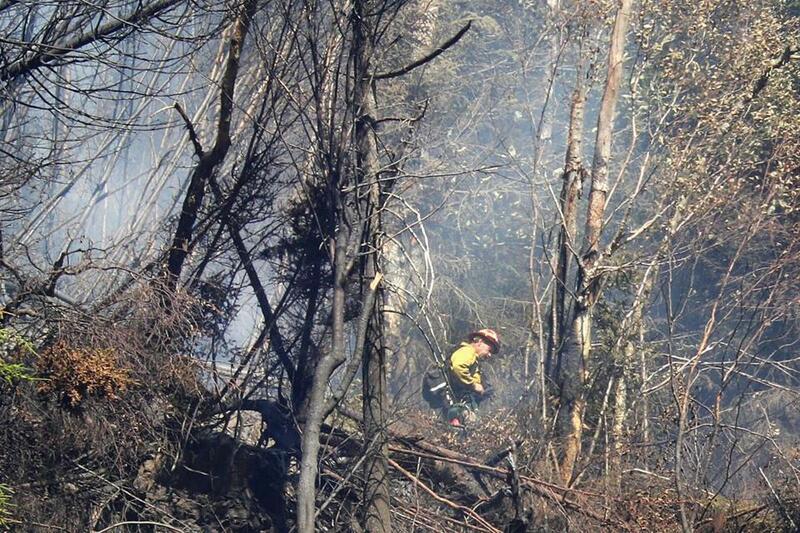 A US Forestry firefighter stood near the summit of the ridge surrounded by burnt trees. Captain John Accardi, a forest ranger with the state Division of Forests and Lands, has been coordinating the response with MacKay, the local chief. But he said a federal command system overseen by the National Park Service is scheduled to begin running operations Friday, four days after the first response to the fire. The ridge where the fire started is private land owned by the Society for the Protection of New Hampshire Forests and operated by the White Mountains Attractions Association. It includes scenic sites such as the Lost River Gorge and Boulder Caves, off Route 112. But the blaze has now spread to land owned by the US Forest Service. On Thursday, local firefighters set up hoses and protection areas to buffer the fire from the wood-framed cabins, bridges, and scenic decks that make up the Lost River Gorge attraction. Meanwhile, roughly 75 firefighters scaled the ledges leading up to Dilly Cliff and toward Kinsman Ridge — challenging terrain that leads to some of the area’s tallest peaks — with shovels, chain saws, and leaf blowers to prevent the fire from spreading. Dilly Cliff sits at roughly 2,250 feet of elevation. 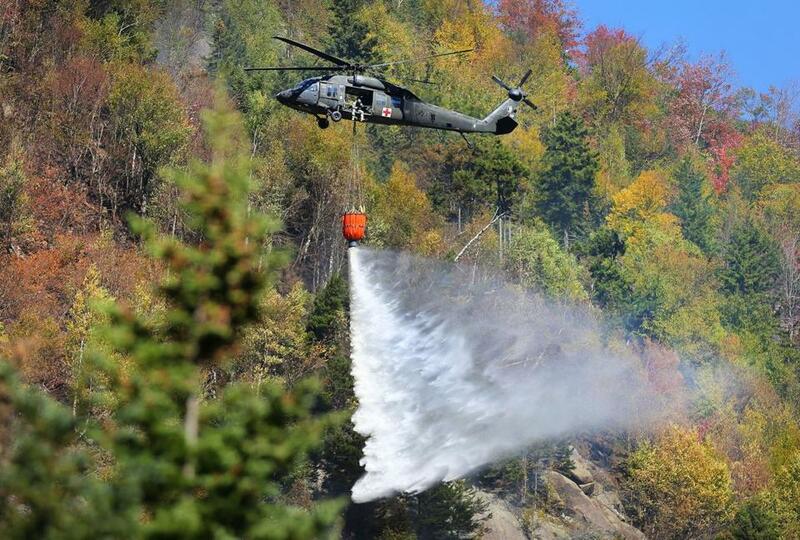 Two Black Hawk helicopters from the New Hampshire National Guard took turns dumping 600 gallons of water on pockets of fire at a time, stopping to reload at the nearby Beaver Pond. Other, smaller helicopters operated by a private company dumped 90 gallons at a time. A Black Hawk helicopter flew to dump 600 gallons of water near the peak of the 600-foot high ridge. Accardi said firefighters have worked well to battle the blaze, only to see it smolder into the evening and pick up with the morning winds. “This is the box we’re trying to contain it in, [the box] is getting bigger,” Accardi said, pointing to a map as he stood at the foot of the fire range. The White Mountains Attractions Association counts on the coming Columbus Day weekend as its biggest attraction of the year — the “Christmas for the retail industry,” as O’Connor put it — when the region sees an estimated 30,000 people make their way to trails and lakes to see the fall foliage, three times what is seen on a typical weekend. O’Connor, who said thousands stop by the visitor center in Woodstock each day, said attractions will stay open. Despite the fire, many still visited Lost River Gorge. Jim and Nancy Hess of Acton had been heading to celebrate Nancy’s birthday in Jackson, just northeast of Woodstock, and stopped to enjoy the foliage. Nancy said she appreciated the changing of the colors, mixed with the unusual view of a military helicopter dropping buckets of water on a blue-sky day. “This is fascinating, watching them fight this fire,” she said. Asked whether she thought a meteor could have caused the blaze, she brushed it off: “You’d think somebody would have heard something,” she said. Chris Briggs, 34, making his way through New Hampshire on a New England vacation from Texas, didn’t realize what was happening until he stopped at the Gorge. “Earth’s a big place. Odds that it happened here are not impossible, but you never know,” he said, making his way to the observation deck. David Tetley, 56, a local who has run odd jobs until he went on disability, has watched the fire unfold for the last three days, since he first saw it while walking to a nearby waterfall on the way to Mount Moosilauke. It has grown, he said. And it looks different at night and roars with the wind. “Everything was just smoke, and it ripped across the ridge at night,” he said. Correspondent Ben Thompson contributed to this report. Milton J. Valencia can be reached at milton.valencia@globe.com.